They are potent superfoods with Chlorella being very well known as a heavy metal detoxifier & Spirulina is a powerful immune system builder. These are NOT supplements - they are just green food! YOU CAN'T TAKE TOO MUCH! Click here for an impresive reference list of Spirulina studies and cancer, obesity, liver disease and more! "With taking only 12 tablets a day, my constipation is gone!" "I'm a computer programmer and my concentration and thinking is so clear now!" "Without drinking coffee my energy level is astounding!" "Hi Tina! We love these algae tablets! We just ran out accidentally and we're bummed. We can tell a big difference since we started using them. Thank you!" "I took 'C&S' throughout the chemo for breast cancer, and I pretty much sailed through the side effects. I have heard and seen other people doing much worse. I am very grateful of how I feel compared to other chemo patients. I'll continue to take these Chlorella & Spirulina combo tablets forever!" "Don't ask how, but I poured boiling hot water on the inside arch of my foot and burned the delicate skin. It hurt so bad I saw stars and couldn't even think what to do!! I called my son and he told me to put ice on it. Blisters were already starting to form. Well, I happened to have some wheatgrass juice ice cubes, so I put that on, but it was all runny, so I quickly crushed Chlorella & Spirulina tablets and made a thick paste with the wheatgrass juice. The pain stopped almost immediately! I left the paste on and stayed in bed all day, re-wetting the C&S paste. Next day? A bare remnant of where the blisters were forming - they never "rose up" and ruptured. The burn healed amazingly fast." "Great on cuts & blisters - heals them fast!" "It totally relieved my breast pain! "Cured my son's strep throat - 60 tablets for 3 days -made a believer out of him!" "My daughter in the Navy is going through the military's toughest school, Nuclear Program. She takes the "greenies" (that is what we call them) to stay alert and clear her mind for learning. She noted a dramatic increase in her test scores when she started taking them. My son in the Coast Gaurd noticed he has no residual muscle pain or soreness when he takes them and comes home quickly to get more (steals mine) when he runs out." "My daughter in the Air Force started taking them to lose weight - she has dropped about 15lbs and that convinced her boyfriend to take them. My daughter that is a nurse and a type-1 diabetic takes them to stay awake on night shift and to supplement her diet without the worry of additional carbs." - Theresa, VA, and again! "My daughter that swims started taking them during swim meets and (along with ionized water) she practiced less this year and made it to states - last year she didn't even get honorable mention!" - Theresa, VA, and yet again! "My oldest daughter started taking the greenies and noticed it cleared up the boils/acne she has been plagued with for more than 15 years (she is a toothpick and her body rids itself of acid through the skin)." "My Mom visited from MS last week and I sent her home with a bag. I told her she can toss out all the other vitamins in her cabinet. I explained that these would be great for keeping her regular and will help with her arthritis... I also gave her a bottle of pH drops for in her purse. That is just a few of the stories I have to tell... I have more and more people asking me for greenies every week.... I can't keep up. You are a lifesaver. Thanks for your great customer service!" 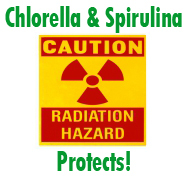 CLICK TO SEND US YOUR CHLORELLA & SPIRULINA TESTIMONIAL! Did you know this about our Chlorella? Chlorella and Spirulina are the world's two most powerful whole foods, containing the broadest array of nutrients. They're both powerful antioxidants, giving you (and ME!) a tremendous amount of energy. Combined they have a synergistic effect and are combined here in one easy-to-swallow tablet about 1/4" in diameter, very easy to take, even when taking quantities at a time. Chlorella contains the highest amount of chlorophyll of any plant known, and its cells are nearly identical to human red blood cells. Chlorophyll also helps carry oxygen around the body and to the brain. That's why Chlorella is often called "Brain Food". It is a powerful immune system builder, extremely detoxifying and excellent for digestion, bad breath and constipation too! Chlorella can be powdered and mixed with water into a paste and applied over a cut, scrape, rash or serious wound to help effectively heal it. It is the Chlorella Growth Factor (CGF) in the Chlorella that makes it such an effective healer of human tissue. CGF may be purchased separately - please contact us for information. Chlorella quadruples approximately every 24 hours, which is a sign of its genetic purity and miraculous abilities to heal our bodies. For instance, Chlorella causes the friendly bacteria in the human stomach (Lactobacilli) to multiple at four times the rate of normal. Chlorella has a unique dietary fiber found nowhere else in nature that binds with heavy metals, radiation and other synthetic toxins and effectively removes them. Our producer of Chlorella uses the pressure differential method of rupturing the outer fiber shell rather than crushing it, an antiquated method, as many other Chlorella producers use. In producing our Chlorella, the pressure is raised suddenly as the Chlorella is sent through a chamber, then it is suddenly released. This is the most effective and organic method of breaking open the cell wall because it does not disturb the nutrients in Chlorella yet allows full access to them. And, nothing comes in contact with the Chlorella the way other methods do. Our process opens 99.9% of the Chlorella , the highest open-wall rating of any brand on the market. Chlorella is one of the MOST scientifically researched foods in human history, as is Spirulina, which NASA has determined will be among the first foods grown on the space station when it is completed. The research done on both of these has come from all over the world by scientists at universities, private industries and Chlorella manufacturers themselves. Not a single negative aspect of Chlorella has ever been sited as far as human health is concerned. Chlorella is a highly regulated product. Ours is grown in Taiwan by the world's largest Chlorella manufacturer. It is scrutinized for purity and bacterial contamination by on-site laboratories and it is the only Chlorella in the world exported and allowed to be sold in Japan that is not produced in Japan. To achieve this, it had to be certified by the Japanese Ministry of Health, which is the only governmental health authority in the world to have adopted and standardized Chlorella quality and certification. The Japanese take more Chlorella per capita than Americans take vitamin C, America's most popular vitamin. However, Chlorella is many times more powerful a whole-food than any other multivitamin or supplement on the market. Chlorella is one of over 70,000 algae species. Some are highly nutritious, others are extremely toxic. Our Chlorella is a very specific strain of algae known as Chlorella Pyrenoidosa. The only other algae we recommend is Spirulina Platensis, which is the Spirulina used in our combo tablets. While there are other consumable algae such as Aphanizomenon flos-aquae (AFA) or Klamath Lake Algae, a blue-green algae, none approach the nutriceutical properties of our Chlorella and Spirulina. Chlorella is a complete food with protein (60%), carbohydrates (16%), fats (5%), fiber (19%) that are in the correct ratio to one another. It is only one of two foods that a person can live on exclusively and still be healthy. Spirulina is the other! If you take a handful of Chlorella with each meal (10 -14 tablets), that will be all the protein you need for that meal. Chlorella and Spirulina are 60% protein with 18 different amino acids in them that are in the correct ratio to one another. Animal protein contains high amounts of some amino acids while others barely register. It is this uneven amino acid compliment that makes animal food a poor choice for a protein base. "In 1941 Dr. S.L.Goldberg reported on treatment of 300 patients suffering from pyorrhea (bleeding gums and loosening teeth), noting significant improvement... Goldberg noted that the use of chlorophyll resulted in a tightening of the teeth, the cessation of bleeding from the gums and the growth of new tissue to replace damaged tissue." - William H. Lee,R.Ph., Ph.D. and Michael Rosenbaum, M.D. "With the continuous exposure of our foods to hydrocarbon insecticides and herbicides it seems that Chlorella should find its way onto everyone's dining table. Chlorella has great potential in aiding the treatment of cancer, AIDS, Epstein Barr virus and other chronic viral illnesses and is especially helpful in preventing the degenerative diseases associated with the aging process." "...The average woman does not have enough iron or calcium, especially after the age of forty, and chlorella is high in both. The average person does not repair and rebuild tissue fast enough, and chlorella helps speed it up. These are some of the reasons why chlorella has such a positive effect on health." - Dr Bernard Jensen, D.O., Ph.D.
"An experiment by the US Army showed that animals fed chlorophyll-rich greens survived twice as long as other animals when all were exposed to fatal levels of radiation." - Dr. Bernard Jensen, D.O., Ph.D.
Did you know this about our Spirulina? Chlorella and Spirulina are the world's two most powerful whole foods, containing the broadest array of nutrients. They're both powerful antioxidants, giving you (and ME!) a tremendous amount of energy. Combined they have a synergistic effect and are combined here in one easy-to-swallow tablet about 1/4" in diameter. Spirulina contains more bio-chelated organic iron than any other whole-food. Bio-chelated means that the iron will easily be assimilated into the body. Spirulina has 58 times the iron of raw spinach and 28 times that of raw beef liver. It's 4-6 times richer in Vitamin B-12 than raw beef liver, it's nearest rival. B-12 is known for providing the human body with high energy. Spirulina contains more beta-carotene than any other whole food. Beta-carotene determines how our cells communicate with one another. "Beta carotene opens the membrane communication channels of cancerous and pre-cancerous cells, allowing the body to signal the cancerous cells to stop dividing. Therefore, foods rich in beta carotene may not only be able to prevent but also reverse cancers. " (Wolf 1992, Spirulina, Nature's Superfood.) Research shows beta-carotene lowers cholesterol, treats wounds and reduces the size of tumors. Spirulina is the richest source of natural antioxidants of any whole-food source. It contains every natural known antioxidant including zinc, manganese, selenium and copper, the amino acid methionine, vitamin E, vitamins B-1 and B-6 and of course, beta-carotene. It is rich in chlorophyll, much richer than wheat grass and alfalfa. Phycocyanin, which is the natural blue pigment of Spirulina, is not found in any other food on the plant. Glycolipid, which is found in Spirulina, has been found to be active against the AIDS virus (Boyd et al 1989). Spirulina is an extremely high energy food. It contains all the B vitamins, which are themselves synonymous with high energy. It has a 95% digestibility rate compared with only 10-15% for most foods. It is extremely high in vitamins, minerals & amino acids (protein). Spirulina contains SOD (Super Oxide Dismutase). This essential enzyme is crucial to the bodies ability to assimilate amino acids (protein). Without its presence in the body, we are unable to create the tens of thousands of long, complex chains of amino acids known as protein. Spirulina's minerals and vitamins are naturally bio-chelated, meaning they are wrapped in amino-acids for excellent assimilation by the body. It contains over 100 synergistic nutrients and is nature's richest and most complete source of total organic nutrition. It is also much more economical than most mass produced vitamins! Spirulina contains more Gamma Linolenic Acid (GLA) than any other whole-food source. GLA is the "miracle" ingredient of Spirulina, and is an essential fatty acid that has been shown very helpful in the relief of joint pain. Spirulina effectively suppresses the appetite, as it is a rich, natural source of phenylalanine-slimmers. Its whole food nutrition facilitates low-calorie dieting without the energy draining and health destroying nutritional deficiencies that are the downfall of most weight-loss programs. Spirulina satisfies hunger because it fulfills the body's nutritional and biochemical needs. Spirulina was used as a central part of the Mayan and Aztec diet, and the Kanembu people, who live along the shores of Lake Chad, still use it today. It is extremely easy to grow and takes less room per cubic centimeter than any other crop known, yielding an enormous amount of nutrition. Spirulina is used by hundreds of Olympic and world champion athletes both during training and competition. Olympian Lees Evans, double gold medalist and holder of four world records in track and field, says: "Spirulina improved my training, resulting in faster times… increased my stamina and endurance." Now as a coach, Lee insists all his athletes use Spirulina. Spirulina is one of the most efficient, oxygen-generating foods known. NASA considers Spirulina an ideal food to grow on space stations and has researched the possibility of using it on long-term space flights. Along with Chlorella, it will become one of the first foods grown on the new Space Station when it is completed. Spirulina has NO toxic side effects the way there are with other blue green algae such as AFA (Afanzamon Flos Aqua, commonly known as Bluegreen Algae). Spirulina is one of over 70,000 algae species. Beware: There is another species of blue green algae, Aphanizomenon Flos Aqua (AFA), which grows naturally in Klamath Lake, Oregon, and a few other places in the world. It is widely available and sells under different names, including the generic name Blue Green Algae. It is recommended this algae not be consumed for several reasons. Klamath Lake is a migratory pathway for thousands of birds, thus the AFA algae is contaminated and extremely high in bacteria. Under these circumstances, AFA algae must be freeze dried to kill the bacteria. 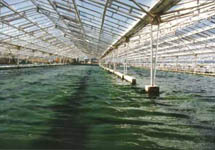 This process, however, destroys the enzymes in the AFA algae. The centerpiece of Spirulina and Chlorella are its enzymes because nothing is more needed by the body than enzymes. No other algaes approach the nutriceutical properties of our Chlorella and Spirulina. Spirulina produces all its nutrients by harvesting sunlight. It gathers and transforms sunlight into green and blue pigments that make it a blue green algae. The blue is an amino acid group found only in Spirulina called phycocyanin, which accounts for its high concentration of vegetarian protein. The green in Spirulina is chlorophyll, one of the best natural detoxifiers known. Spirulina and Chlorella are ideal foods to feed a starving world and they have been used in Third World Countries to relieve hunger with great effectiveness because they are inexpensive, nutritionally compact and not given to quick spoilage. Spirulina provides anti-aging benefits, fortifies the immune system and its antioxidants clean up free radicals, preventing the oxidative damage that ages us. Has 60% amino acid content! Studies suggest the unique characteristics of Spirulina enhance cell nucleus enzyme activity and DNA repair synthesis. This may be why several scientific studies, observing human tobacco users and experimental cancers in animals, report high levels of suppression of several important types of cancer. The subjects were fed either whole Spirulina or treated with its water extracts. - Babu., M., et al, Nutrition and Cancer 1995, V. 24, No. 2, p.197-202. Evaluation of Chemoprevention of Oral Cancer with Spirulina fusiformis. Sacramento, CA, - Scientists announced the natural food Spirulina dramatically strengthens the immune system. Immunologist and Professor M.A. Qureshi, PhD, released a study, "Immunomodulary Effects of Spirulina Supplementation in Chickens".This study shows small daily doses of Spirulina in a poultry diet (less than 1%) greatly improve T-cell and thymus function. The whole immune system is supercharged, and the birds in the study were much more resistant to infection. Petaluma, CA January 2, 1995: A Russian patent was awarded for the use of Spirulina as a medical food for improving immunity of the Children of Chernobyl. Studies showed that 270 children, living in highly radioactive areas, had chronic radiation sickness and elevated levels of Immunoglobulin E (IgE), a marker for high allergy sensitivity. Thirty five pre-school children were prescribed 20 Spirulina tablets per day (about 5 grams) for 45 days. Consuming Spirulina lowered the levels of IgE in the blood, which in turn, normalized allergic sensitivities in the body.